Garfield (by Jim Davis) is my most favourite childhood cartoon character, I find him cute but i'm not lazy like him. I just like the way he act, very relaxed and straightforward. With his cute and fat features, it makes me love to draw him since I was young. 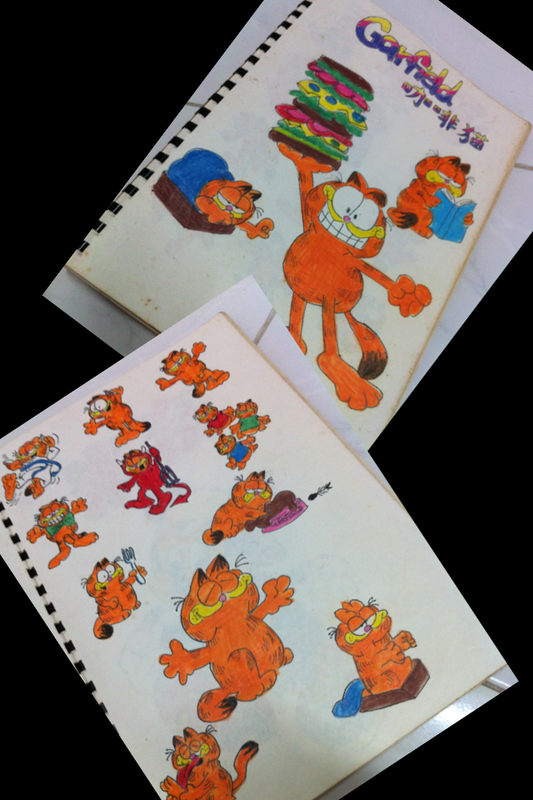 I've spent most of my childhood drawing Garfield, believe it or not, I was asked to draw and sell it last time :) See my primary 6 art book collection and you will understand why, I felt lucky that my mum still keep this album for me in very good condition. All of these precious collections are my hand drawing with colour pencil, from sketch until colouring, I did it all by my own in the age of 12. With my strong drawing Garfield foundation since young, I can draw it without referring to any sample now especially for its face expression. For me, I prefer to draw its face only without the full body. 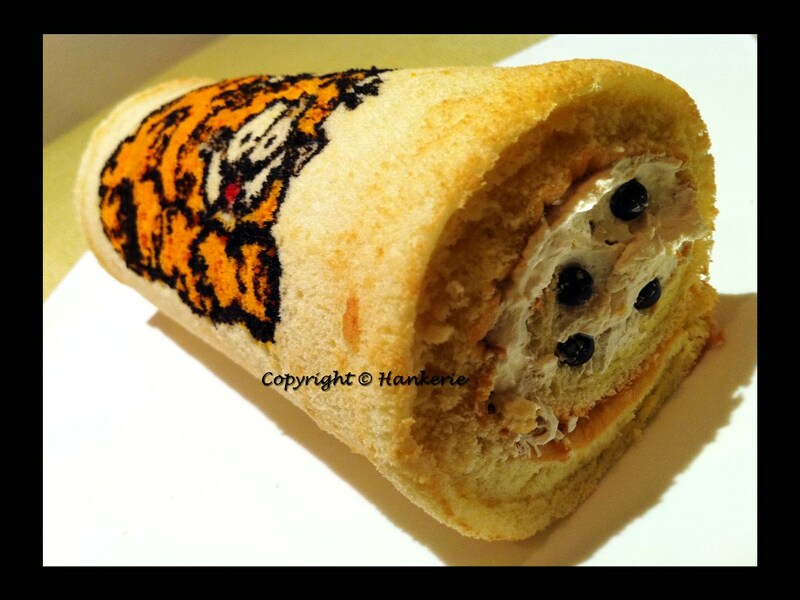 For drawing on top of swiss roll, it's indeed looks much nicer to draw with full body. To try out the new flavour of my swiss roll as well, I add on some special chocolate chips that I bought from Singapore last week, highly recommended by Jean Yau. Thank her so much to bring me around - visited 3 different bakery supplier shops in Singapore. For my little Hankerie's fans (Kids), I have some activities for you. You may ask your parents to print this Garfield to do some colouring. Hope you enjoy! 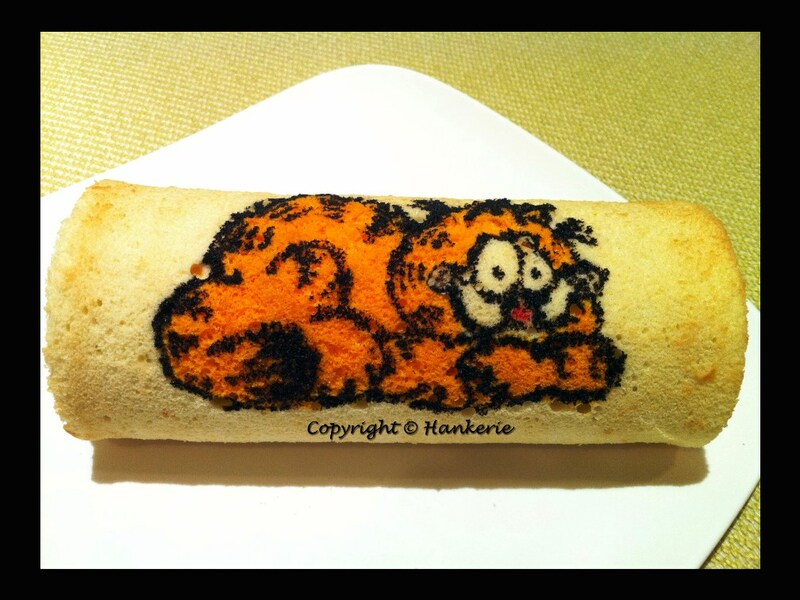 Nice Garfield. But where is Odie?